Well, I tried to load a short video taken by my wife Margaret of the Earthwork-Women's set at the Harvest Gathering where I have been for the last week, but it failed. The video was poor, the sound was poor, but the spirit of the Earthwork woman is not. The woman artists in the Earthwork music collective offer a special set each year for listeners, where each of them sings a song. In this case, my daughter Anne is singing Dylan's "I Shall Be Released.' Thought you might like to hear a little taste of their solidarity. The Annual Harvest Gathering is over; I am back home where my dog has been waiting for me all this time. I have way too many mosquito, spider, and bug bites than I would like and it feels so good to have my own shower and bathroom back, not to mention sleep. I have not slept much in days. Where I sleep at the gathering is between two of the four major stages, and right next to what is called the Cedar Stage. 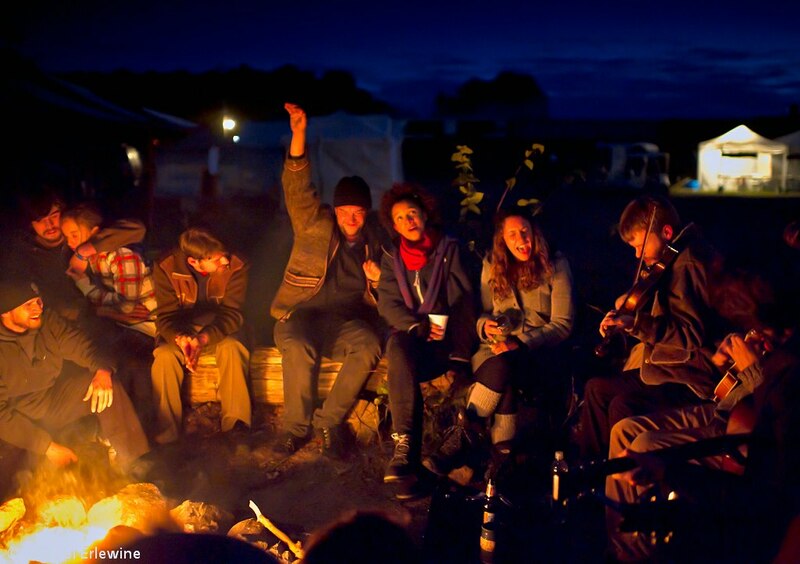 The stages go until at least 2 AM every night, with bonfire singing after that, which is also close enough. Every beat of the bass shakes the whole house, and even with my earplugs I can hear every note perfectly. Sleep, for me, does not come until sometime after 2 AM, and then I still wake up at between 3:30 and 6 AM to start my day, so I am screwed when it comes to rest. And you heard no posts from me after a while for a number of reasons. For one my laptop just stopped working and it had all my photos on it, and once the formal gathering started, what little Internet there was (which was open to all) got sucked right up so I had zero to no bandwidth. And last my schedule just got too packed, and I was lost in the stream of events for a while. But I am back. I wish I had the space here to tell you all about it, but instead I will just touch on a couple of highlights. Not exactly a highlight, but very prominent was the rain on Saturday and much of the day Sunday. As they say, the rain really put a hitch in my git-a-long. It certainly muddied the mud. Of course I ran my meditation-instruction tent, but even inside the tent things got wet when the wind blew. Even so, I met some wonderful folks and had great conversations about dharma practice in that little white pop-up. One of the great music acts that took the gathering by storm was the Irish music group "The Olllam," featuring my good friends Tyler Duncan (low-whistle, uilleann pipes) and Mike Shimmin (drums), and my new friend John McSherry (low-whistle, uilleann pipes). McSherry is just over from Ireland. Myself, I am half Irish. My ancestors are Careys and hail from County Carey. "The Olllam" is traditional Celtic music on steroids, music that breeches the 21st Century and masterfully surfs its restless spirit. Tyler Duncan is something like three times world champion of Irish music, on the Bodhran (Irish hand drum), the uilleann pipes, and I can't remember what else. He is a master. However, John McSherry is Duncan's mentor and also world famous in Ireland. So here was some music that stopped the clock of time, at least for an hour. The crowd went crazy over it. Then on Saturday, I had the honor of driving John McSherry around the gathering in a golf cart, and introducing him to number of my favorite Michigan musicians, including "Breath Owl Breath," The Josh Davis Trio," Daniel Khan, and others. We went all afternoon and on into the night. I can't remember when I went to bed, but it was late. Of course, there was much, much more going, but I do want to tell you of my favorite moment. As official babysitters for my daughter May and her husband Seth's 6-month-old daughter (our granddaughter) Iris, Margaret and I were on call. And one of those babysitting sessions was during May's song-set on the Cedar Stage. Margaret and I bundled up Iris and ventured out of the trailer into the crowd. I mentioned the rain, and it was certainly present for May's performance. I held an oversize umbrella (with rainbow colors) over Margaret, who was carrying little Iris wrapped in a sling. We carefully made our way through the woods and came up along the side of the stage where May was singing. For this set May had her whole band, which includes Seth Bernard on guitar, Mike Shimmin on drums, Joshua Davis on piano, Max Lockwood on bass, and Laurel Premo on fiddle. As I looked out on the crowd, you could see the sheets of rain falling above the crowd almost like in slow motion. It was trancelike and beautiful. Here was this sea of umbrellas and ponchos, plus some folks with no cover at all. All were huddled as close as they could to my daughter May at the front of the stage. They were listening intensely. And May was not singing fast or upbeat songs. It is just a few days before the New Moon, and things can get touchy. May was singing what I call "heart songs" to the crowd, something coming from deep inside her. Everyone knew and felt this. Something almost like a transmission was taking place, so there was this sense of serious in the air. As for me, I was suddenly transported by what I saw. Here in this Harvest Gathering, this sea of musicians everywhere around, and this particular one set of my daughter May's. She was singing from deep inside her. Perhaps this is what she is born for, to change up time for the rest of us, if only briefly, and in those moments to share not just herself, but to allow all of us to share ourselves openly, if only for a brief moment. But for me that time is all the time there is that it worthwhile. Those moments of empowerment that see through clock-time into some kind of eternal moment. It is hard to put it in words, but I found myself fighting back the tears, which just rolled down my cheeks anyway. There, in the rain, with all of these faces under a wide sea of umbrella-tops, I stood with my wife and with this tiny child, my granddaughter, listening to my own daughter sing to us like I never could. She was singing an inner message that everyone wanted to hear, to absorb, and internalize. I swear, it was a transmission. Onward of course; time insists on that, but also inward for a moment to something more meaningful and eternal than just the mere flow of events. As far as I'm concerned my life is punctuated only by events like this. These are the pole stars that guide me. It is that simple.